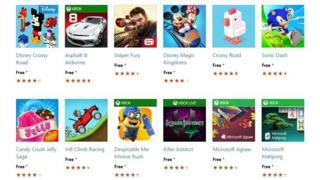 Image caption The most popular PC games currently on the UK Windows Store. Businesses running the professional version of Windows 10 can no longer block access to the Windows Store. Following an update the function is now available only on the more expensive Windows 10 Enterprise version, as well as the Education edition. Many firms try to prevent staff from downloading additional software as it can cause problems with existing programs and affect productivity. Microsoft said it had made the change "by design". "Windows 10 Enterprise is our offering that provides IT pros with the most granular control over company devices," the tech giant said in a statement. "Windows 10 Pro offers a subset of those capabilities and is recommended for small and mid-size businesses looking for some management controls, but not the full suite necessary for IT pros at larger enterprises." John Harrison, owner of Harrison IT services, said the change could cause problems for small businesses. "Users like to change settings or try to install software by themselves. If they don't know what they're doing or don't have the appropriate experience, they can cause all kinds of issues," he said. "You are going to have to educate staff, tell them not to use the Windows Store unless it really is relevant to the business. How do you manage that policy?" In September 2015 there were 669,000 apps on the Windows Store, according to Microsoft's own figures. Microsoft says there are 300 million devices using Windows 10 one year after its launch. On 29 July, a free upgrade offer for Windows users with earlier versions of the operating system will come to an end.